Home » Fifteen Years On, What Ever Happened To The ‘So Pitted’ Viral Surfer? Fifteen Years On, What Ever Happened To The ‘So Pitted’ Viral Surfer? FOX news caught up with Micah Peasley fifteen years on from his viral interview. In 2002 California based surfer Micah Peasley was catapulted to viral fame after he gave an interview on FOX news describing an epic hurricane surf session. The clip has since become the most viral surf video ever, garnering hundreds of millions of views and spawning a whole host of parodies and spin-offs. 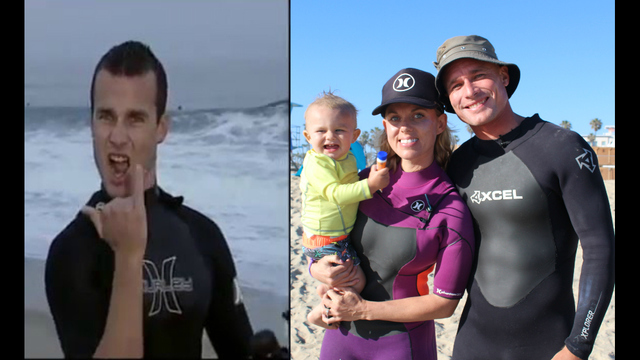 Fifteen years on FOX news caught up with the infamous ‘so pitted surfer dude’ to find out what he’s up to now and it turns out he’s a pretty ordinary 35 year old bloke with a young family. Micah is still very much into surfing and has capitalised on his internet fame by starting a surf school called ‘Get Pitted Surf & Snow’. Micah says he remembers the interview well, and tells of how he decided to put on the classic surf dude character when he saw the reporter approaching him on the beach. “People were thinking, ‘Was he being serious? Was he faking it?’ And truth of the matter was, I was seriously faking it,” Peasley said, laughing. Unsurprisingly due to the video’s crazy hit count, Micah is still recognised often. However his wife Nicky, with whom he now runs his business, had no idea who he was when they met, adding that he’s not the ‘dumb surfer’ he portrays in the interview, but that his fame certainly helps bring in business.